I still can't access your website! What do I do? I forgot my ID or password? Help! I placed an order, when will it ship? I need to claim a damage/return! What do I do? 1. How can I join Umgeeusa.com? Register by clicking the link, [Be a Member] located on the top right-hand corner and fill out the application. Please be advised that some states and international businesses will not have “Seller Permit.” You can also submit an application using your Business License, State Certification and/or Federal Tax ID (EIN). 2. I already registered but I still cannot access website. Do I have to register again? After submitting your application and requested documents, Umgee USA, Inc. needs to review your information for verification purposes. This procedure usually takes 1-2 business days. After verifying your information, we will grant you access to our online store. You will receive an Email with your log-in credentials. If you have not been granted access within 3 business days, please contact us at (323) 526-9138 or web@umgeeusa.com. 3. Why is verification needed for access? Since Umgeeusa.com is a wholesale online store, the verification is necessary to confirm that the merchandise is purchased for resale only. 4. Can non US-residents obtain a membership? Yes. Umgeeusa.com caters to all re-sell businesses worldwide. International businesses will usually have their country or region certificates for business. Such documents will suffice for registration. 5. Can I change my member ID and password? Yes, you can change your ID (email) and password by clicking on [MY ACCOUNT] and [Change ID & Password]. [MY ACCOUNT] is located on the top right-hand corner of the website. 6. I forgot my ID and Password? If you forget your password, please enter your User ID and registered Email address in the [FORGOT PASSWORD?] section and an automated Email of your credential will be sent to your registered Email. If the Email address you registered with is no longer valid, please contact our customer service center at (323) 526-9138 or Email us at web@umgeeusa.com. 7. How can I change my member information? Click [MY ACCOUNT] and edit your information. 8. How can I unsubscribe from newsletters? Click [MY ACCOUNT] and [MEMBER INFO EDIT] then change [E-MAIL RECEIPT] to No. You can change back to Yes anytime you want. 9. Will my personal information be shared with other companies? 10. How will my personal information be protected? Umgeeusa.com strives to maintain secure servers and networks for our clients. Umgeeusa.com is maintained with routine security sweeps, firewalls, and anti-virus systems. 1. I placed an order, what next? Upon the completion of your order, general processing time may take up to 1-3 business days. Once the order is processed, payment for your order will only be charged when the items are shipped. We do not pre charge your order without your consent. We accept all major credit card companies. 2. How do I know if my order shipped? Within one business day you will receive a follow up email with detailed information regarding the status of your package. Please note the email will not contain a tracking number, however a follow up email will be sent directly from UPS regarding the status of your package. 3. When will my back order or pre order items ship? Back orders or pre order items will be shipped as they become available. All orders will be shipped as ready unless the customer has requested to be notified when the items arrive. Due to the high demand of Umgee styles, the stock of varying items may change within a day. Please note, to expedite the shipment of your orders we highly recommend that we have the authority to "SHIP AS READY." Customers who require a "CALL BEFORE SHIPPING," may delay the shipment of your order due to failure of communication. If you have any further questions or concerns regarding your orders, please contact the web team via email: web@umgeeusa.com or by phone: (323) 526-9138. UPS is the only option with insurance for lost, stolen or damage packages. UPS will attempt to deliver up to 3 times, all International orders and orders over $3000 require a signature. If you select USPS, you can't file a claim for lost, stolen or damaged packages. UPS will not ship to PO boxes. Umgee USA, Inc. may need to switch your shipping method if you ship to a PO Box using UPS. If you select EXPEDITED PROCESSING, (UPS Next Day Air, UPS 2nd Day Air, UPS 3 Day Select and USPS Priority), Umgee USA will process your order the same business day if received before 8:00 am PST or California time (Next business day if received after 8:00 AM PST or on Saturday/Sunday/ Holidays). Please note that a Credit Card Authorization will be required for any EXPEDITED method. We do not offer Saturday/Sunday delivery. For international orders, we do not reimburse customs fees, conversion fees or import fees charged by your home country or your financial institution. Please understand that international orders may take 1 week and up to 3 months to arrive after shipping due to customs inspections or other delays outside of Umgee USA control. If you use USPS for your international order, tracking will stop once the package leaves the United States. Umgee USA STRONGLY recommends UPS for all orders, as tracking information is available from start to finish as well as the option to opt-in for insurance. Changes and modifications to orders are NOT allowed once order is “Confirmed” or “In Progress.” Orders placed prior to promotions are not eligible to receive new promotions or discounts. We reserve the right to cancel any order due to unauthorized, altered or ineligible use of the order and to modify or cancel any promotion due to system error or unforeseen issues. Free gifts will not show up on the order invoice, but will be included in the shipment. We are confident you will enjoy our products and thank you for your purchase! Your claim must be submitted by email within 10 business days of receipt of goods, please email webreturns@umgeeusa.com for your return authorization (RA) Request. All packages must be unopened and include original label. Returns must be unworn, unaltered and unwashed with all tags still attached, only damaged goods will receive return labels. Returned packages without an authorization will be shipped back to customers at their own expense. Failure to follow all requirements will result in a 20% restocking fee. Should you receive a damaged or defective item, claims must be made over email (including pictures of defect) within 10 business days of receipt of goods, otherwise claim will not be honored. Any return not considered a damage will be returned at customer's own expense and must pay a 10% restocking fee for a non-damaged return. *UMGEE USA will not issue a return authorization for damages and return claims AFTER indicated dates. Should you receive defective items, please send all information listed above in “#1” to webreturns@umgeeusa.com. Further instructions will be advised by e-mail. 1. Do you have a size chart? Yes, we do! Please note that the following chart is a guideline. 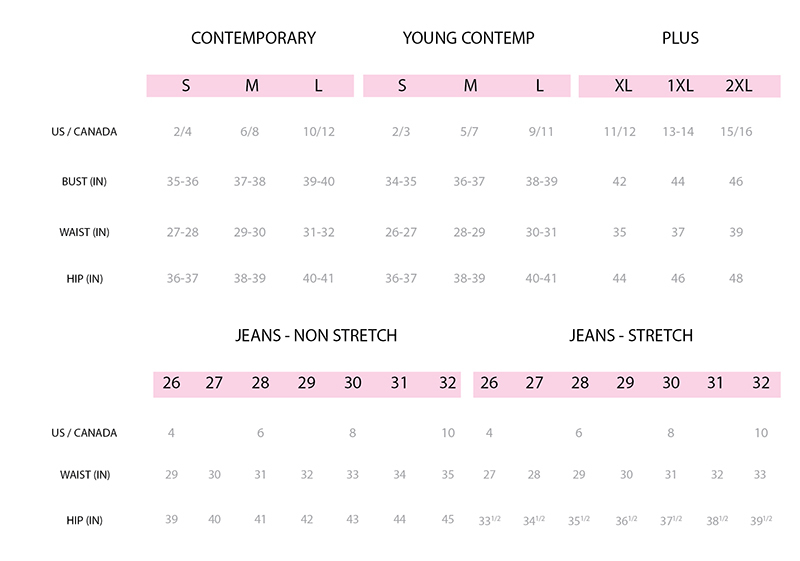 Depending on the style and fabric of the garment, sizing may slightly vary. All measurements are approximate.